There was a design error discovered in the 10359 & 10359A boards - due to a wrong source the sensors connected to J2, J3, J4 were powered from the 10359's 2.5V instead of the correct 3.3V coming from 10353. Because of that the linear regulators on the sensor board could not maintain nominal output voltage (2.5V, 2.8V) and isolate the analog from the digital supplies. Sensor did great job operating in such conditions in such a way that image deterioration was almost not noticeable - very faint vertical stripes with a 4-pixel period on a 10338D board. Older 10338A used different linear regulators and output voltage was slightly higher, so no vertical stripes were visible (but we would still recommend to replace (or fix 10359 boards as the noise level can be reduced when applying correct power). The fix should be applied to all 10359 & 10359A boards. Connect the via (hole) to the trace as show on the image. Verify (with any low-voltage circuit tester) that the all the power connections to the sensor boards (pins 3 and 4 of each of the J2, J3 and J4) are connected together _and_ to the 3.3v bus. 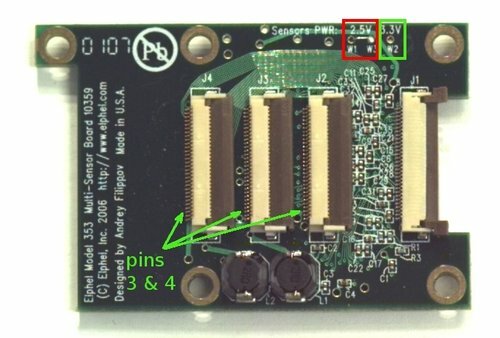 And verify that 3.3V and 2.5V traces are not connected together (you may find 2.5V and 3.3V marked near PCB jumpers on the bottom side of the 10359A board and on the top side of the 10359 rev0). If they are connected, check step 1. 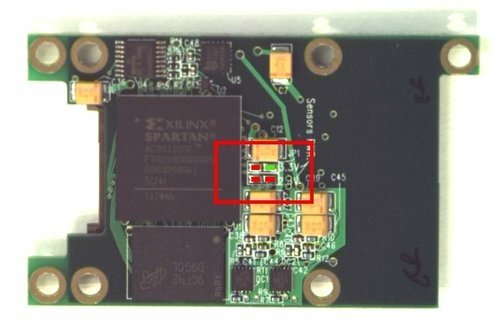 If no connection to 3.3V - check step 2. 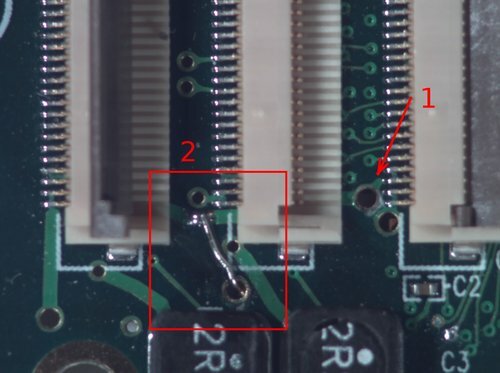 If J2.3, J2.4 is not connected to J3.3,j3.4 - drill broke the top level connection and you need to add a wire bridge to the top layer trace.